← European Peacock near Halifax! Another new butterfly species has been found in the Maritimes! This time it’s Ocola Skipper, an essentially tropical species whose permanent range gets as far north as Texas and Florida. 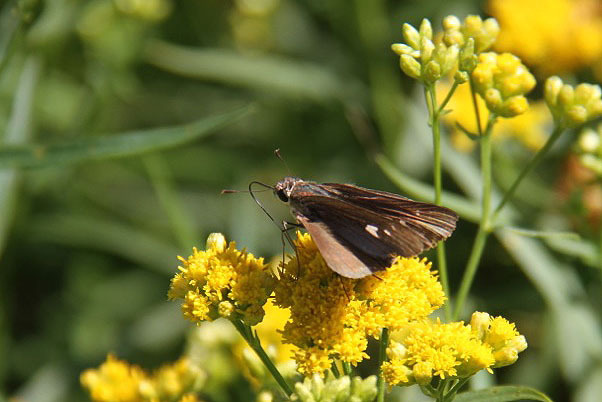 On August 19th, Marcy Wagner of Lubec, Maine, photographed Ocola Skipper nectaring at Grass-leaved Goldenrod at Fox Farm, in Roosevelt Campobello International Park, on Campobello Island (approximate coordinates are 44.855756°N, 66.966224°W). Ocola Skipper annually migrates north of its permanent range in the late summer. It has been recorded breeding as far north as Virginia, and in the past has wandered as far north as southern Ontario and Massachusetts. Campobello Island is the furthest north the species has ever been detected! Ocola Skipper has been recorded in seven different years in southern Ontario. In four of those years multiple individuals were found, suggesting that when they stray as far north as Canada they do so in numbers. Therefore it is likely that other Ocola Skippers are about, so keep an eye out for this southern stray when you’re butterflying! As with other migrants, this species is most likely to be found in coastal areas. There is still lots of time for others to be found: all Ontario records are from September and October.